Help us reach 1 million petitions to defund Obamacare. I have great news to share. 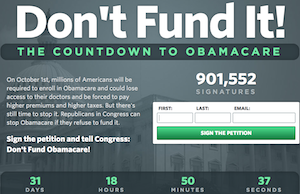 Over 900,000 freedom-loving Americans have now signed the petition to defund Obamacare! But, we need 1 million to truly send a signal to Washington that we want Obamacare defunded. If we work hard, we can accomplish this goal by Labor Day.Please help us reach 1 million signatures by forwarding this email to your friends and family. Encourage them to join hundreds of thousands of other Americans who are expressing their opposition to Obamacare at DontFundObamacare.com.Then, spread the word by sharing it on your Facebook and Twitter accounts.If we work together, we can reach 1 million signatures and send a message to Washington that can’t be ignored.We can stop Obamacare, but we need a grassroots tsunami to do it.There are far too many Republicans scared of the fight, but together we can unite Republicans to stop this huge train wreck.Thank you for standing strong for freedom. You’re receiving this email because you subscribed to the Senate Conservatives email list. Please do not reply to this message; click here to contact us.Senate Conservatives Fund (SCF) is an independent, grassroots organization dedicated to electing true conservatives to the United States Senate. SCF only supports candidates who have the courage to put principle ahead of party and fight for limited government, a strong national defense, and traditional family values. SCF is not affiliated with the Republican Party or any of its campaign committees.Contributions to the Senate Conservatives Fund PAC are not deductible as charitable contributions. Contributions from corporations or foreign nationals lacking permanent resident status are not permitted. Federal law requires Senate Conservatives Fund to report the name, mailing address, occupation and employer for each individual whose contributions aggregate in excess of $200 in a calendar year.Not paid for at taxpayer expense.